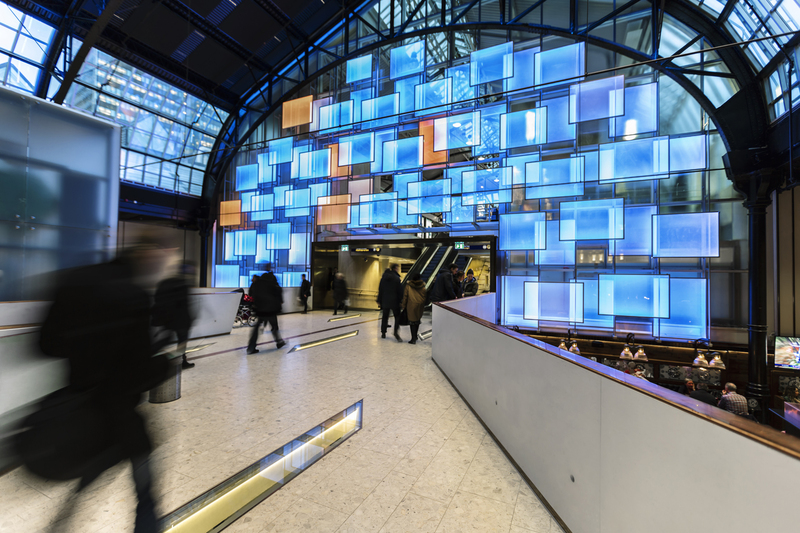 A pixel wall designed by ÅF is the centrepiece in Ø, the new name of Østbanehallen, the food court at Oslo Central Station. The wall was used for a light show to mark the grand opening of Ø. Last week Ø reopened following extensive renovations to the old centrally located building. The central hall in the building now houses restaurants and cafes and is a natural meeting place for the citizens of Oslo with its location at the end of Oslo’s main shopping street, Karl Johans Gate. ÅF's Lighting team has planned and designed the lighting of the entire building including the square in front of the building, the façade and the hall. At the end of the indoor hall, a colourful pixel wall piles up: 71 transparent LED panels form a “one-of-its-kind” pixel wall. The panels can be individually controlled allowing the colour of each panel to be changed. The creative idea behind the design is sunrise and the beginning of the day, as the building faces east. The wall makes it possible to imitate the sunrise indoor and create different mood lighting throughout the day. The lighting in this fascinating old building emphasises the beautiful construction and highlights its history and previous function as a departure hall for passengers using the railway. The functional lighting includes 450 fixtures and 6,000 diodes using the newest technology, Dark Light LED-fixtures. Ø is the first place where this technology is put into use in Norway. Mellbye Arkitektur Interiør AS is responsible for the gentle modernization where only the best materials have been used to create a seamless combination of old and new. The lighting design underlines this ambition with its subtle integration into the building’s construction. An advanced lighting control system automatically adapts the lighting to the seasons and time of the day, ensuring the optimal use of daylight and improving energy efficiency. Ø opened on Thursday 5 February with a colourful lighting show designed especially for the event. ÅF has also been consulting engineers on the building’s HVAC and electrical installations. For questions about the project, contact Morten Jensen.